Not related to EA's Strike series, Siberian Strike X is a decent vertical shooter which resembles an updated 1942 remake. 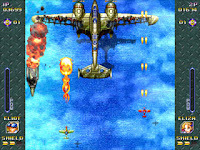 Frame rate is rather low though the gameplay is intact, with three planes to choose from and standard power-ups to collect. The demo showcases too little content to warrant a purchase, plus only half of what is playable involves shooting enemy fighters down. A trial version for the PC is available for download.